Antarctica is losing ice mass while gaining ice extent. This is a confusing point to some. There are a few keys that can help us understand what this means in the context of global warming. Land ice is different than sea ice. 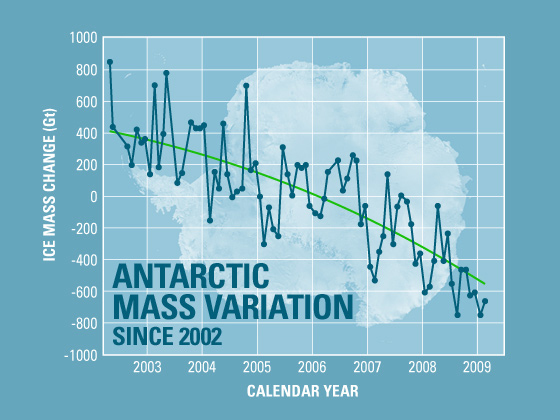 Antarctica is losing ice as illustrated below in the ice mass chart from the GRACE satellite. 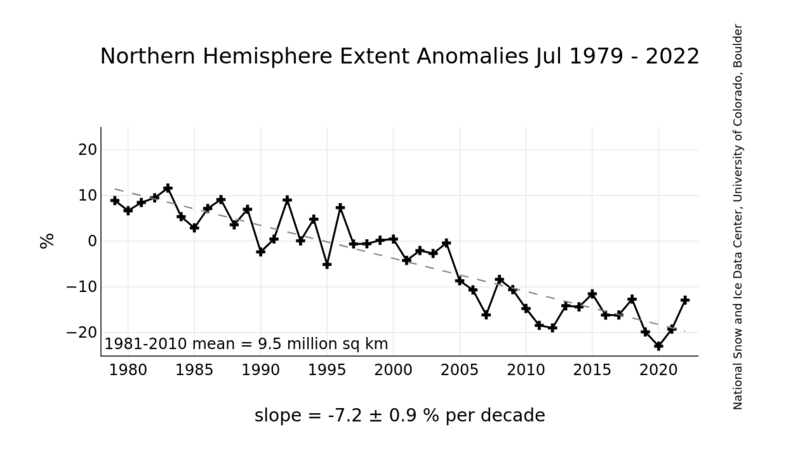 The sea ice-extent is increasing as expected based on observations and model studies. Context is important here. While it is warming in the Southern Hemisphere (SH), there are other things changing that influence Antarctic Sea Ice Extent. While it is warming in and around Antarctica, It remains cold during winter which allows ice extent to grown each winter. The growth of Antarctic Sea Ice is likely due to changes in ocean and wind circulation combined with changes in moisture levels and related factors that are related to the ice extent increase. There is indication that changes in stratospheric ozone may also play a role. Some models and studies hypothesized this would occur, so the observations are in line with such expectations. Further attribution studies will help confirm the degree of connectivity to current climate change. The model shows that an increase in surface air temperature and downward longwave radiation results in an increase in the upper-ocean temperature and a decrease in sea ice growth, leading to a decrease in salt rejection from ice, in the upper-ocean salinity, and in the upper-ocean density. The reduced salt rejection and upper-ocean density and the enhanced thermohaline stratification tend to suppress convective overturning, leading to a decrease in the upward ocean heat transport and the ocean heat flux available to melt sea ice. The ice melting from ocean heat flux decreases faster than the ice growth does in the weakly stratified Southern Ocean, leading to an increase in the net ice production and hence an increase in ice mass. This mechanism is the main reason why the Antarctic sea ice has increased in spite of warming conditions both above and below during the period 1979–2004 and the extended period 1948–2004. 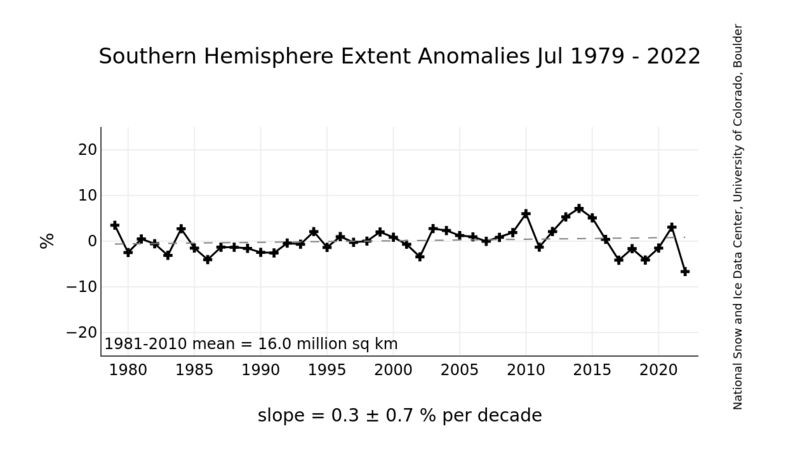 Generally, in SH winter, ice extent can grow more than usual, while in summer the overall satellite observations show that ice mass of Antarctica is decreasing. With more snow precipitation in Antarctica one might expect that the ice mass would grow as well, but at this time the ice discharge (calving) rates are increasing. The Arctic, in the Northern Hemisphere (NH) acts in the opposite direction regarding ice extent, and is also losing ice mass. The main reason that the NH is not gaining ice extent like Antarctica is the Northern or Polar Amplification Effect. This is due to the fact that the NH is mostly land, while the SH is mostly water and ice. So the two hemispheres behave quite differently.